Advice: With ordinary talent and extraordinary perseverance, all things are attainable. 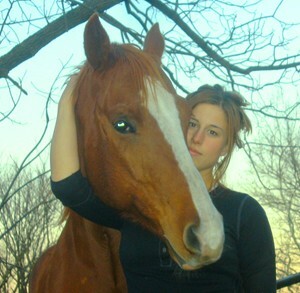 May 2007 - I have dreamed about a life with horses for as long as I can remember. Growing up just outside of Washington D.C., the opportunities to pursue such a passion were limited. It seemed that either you were born into a life with horses or you had to be wealthy enough to afford lessons. Unfortunately I was neither. So I did what every horseless girl does. I read books and watched movies. I studied the breeds and their colors. I spent hours in my room flipping through magazines carefully debating which horse I would someday choose. I clipped classified ads of “free to a good home” horses and houses for rent in the country and attached them to my Christmas list. I started saving my money in a horse jar where I happily accepted donations. Then at twelve years old I spent the summer in upstate New York with some friends of our family who owned several horses. I finally got a chance to ride. I spent every second at the barn. Brushing and fawning over an old quarter horse mare named Cinnamon. To me she was perfect. I rode her for hours back and forth from the barn to the house. When summer ended I went back home. I knew then I would never be cured. I would never stop wanting and longing for a horse of my own. Time goes on and horseless girls grow up. I rode over the summers when ever I had the opportunity, but as I transitioned into adulthood my dream of a life with horses fell by the wayside. It was time for the real world. I had to be practical. I had to make money. So I spent the next several years talking myself into wanting something else. I sold cell phones, I became a pharmacy technician, I took real estate classes, and I worked as an office manager for our family business. You name it I tried it. I was successful enough. I owned my own home and I had some money in the bank but the truth is I was miserable. One night I was home feeling sorry for myself and I got online to look at horse sites. 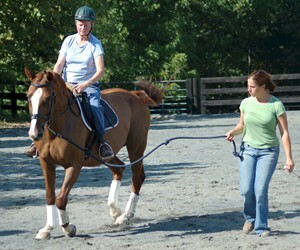 I began to search for horse related jobs and horse schools and stumbled across the Meredith Manor site. I began reading Dr. Meredith’s training articles and couldn't stop. I stayed up arguing with myself about whether or not to fill out the form requesting information. It was only a catalog. What harm could it do? The entire next week I ran home to check my mailbox for the package. When it arrived I sat down next to the mailbox and ripped open the envelope. As I flipped through the pages my mind began to race. What if I could do this? What if I sold my house, and my car, everything but the dog? What if it’s not too late? My mother and I took a trip to the campus for a tour. At the end of the tour I was already certain. I wanted nothing more. I didn’t care if people would think I was crazy. I was in love again. With the smells and the sounds, and with the curious creatures that followed me with their eyes as I walked through each barn. My parents were so moved by my excitement that they decided to support my craziest decision yet. I sold my house and packed the dog and moved to West Virginia. The next few months were very hard. I was sore in muscles I never knew existed. I was blistered, bruised and exhausted. I had so much to learn that I might as well never have ridden. Luckily I made friends quickly. They never tired of my questions and they didn’t laugh (much) at all my ridiculous mistakes. They encouraged me through difficult times when I wasn’t sure I could keep going. There is something that happens to you when you are pushed to the hilt of your mental and physical limitations. You are forced to look inside yourself and see what you are truly made of. There were times I was terrified, there were times when I was discouraged to the point of tears, but I learned that I was much stronger than I ever imagined. I learned that you can accomplish almost anything with drive alone. 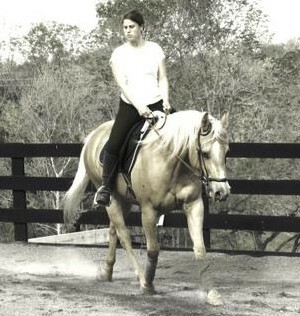 With every new horse and every new semester my confidence and skill level improved dramatically. I was becoming a rider. A lot of thought goes into the curriculum at Meredith Manor. As you progress through the levels of riding, training and theory your strengths begin to surface. Interestingly many students end up changing their major along the way, specializing in something completely different than they intended. I thought I wanted to be a trainer. After all, the dream was to work with horses so why bring people into it? While I learned a lot from my training classes I found myself drawn more and more to another area of study. A new passion began to emerge when I discovered teaching. What makes the teaching program at MM so different is that we are required to become a teacher first and a riding instructor second. A great deal of time is spent studying the aspects of communication and different methods of teaching different learning styles. We learned to incorporate our working knowledge of horses with the ability to communicate and motivate our students. After my first student I was hooked and I knew this is what I was meant to do. The only thing that made me happier than making progress with a horse myself was the ability to help someone else have that same experience. Teaching is truly the best of both worlds and I can’t imagine anything I’d rather do. Graduation was definitely a bittersweet time for me. I said goodbye to my new family as they moved on to their new lives and I made the decision to stay. I was accepted into the graduate assistant program where I was able to continue on as a student teacher and gain invaluable experience. When I finally left the manor I had accumulated almost 2000 hours in the saddle under some of the finest instructors in the world. It didn’t matter what I started with or how long it took to get here. I was a new person, full of the confidence that comes along with realizing a dream. This achievement was only the beginning. I had a solid foundation to continue on my own, to set new goals and realize new dreams. 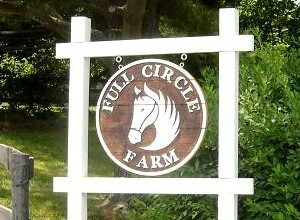 I have since acquired my own facility in Virginia where I teach, train and ride everyday. Making a decision to change the course in your life can be very difficult. No matter what your dream is there are always obstacles and often many more nay sayers than believers. Wanting to be something more than what you already are, even if the comparative greatness is only in your own eyes, is something that ought to be worthy of encouragement. I have learned that pursuing a dream is never ending. No set goal achieved satisfies. Once you find you are able to accomplish more than you imagined you will begin to wonder what else you can do. I will always look fondly upon my time at the Manor. I am grateful for all that I learned there, for the blood sweat and tears and the lifelong friends. I am happy to be where and who I am today and I can’t wait to see where the journey takes me from here.